Nestling in the natural beauty of the wilds, situated in the splendid valley of Merchula, on the banks of Ramganga river, Tree Tops Riverview Resort is a fairytale luxury jungle resort on the edge of the Jim Corbett Tiger Reserve. The Tree Top Resort setting is picture-perfect, spacious rooms, rich furnishings complemented by spectacular views of mountain ranges, panoramic valleys and ramganga river make the rooms & cottages very special retreats. This fairytale resort offers a tranquil sanctuary and presents a picture of breathtaking natural beauty in Jim Corbett Tiger Reserve. Tree Tops Riverview Corbett hotel is located in dense forest area in the valley of Marchula in Jim Corbett Tiger Reserve. 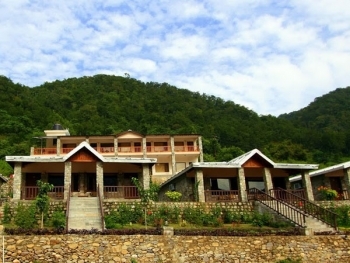 The resort is under leopard zone and in Jim Corbett National Park reserve area division. Drive from Ramnagar to Marchula where Tree Tops revierview resort is located in itself is full of thrills of jungle safari and offers breathtaking view of the forest and mountain ranges. All rooms & cottages in Tree Top Resort offers spectacular views of mountain ranges, panoramic valley and Ramganga river. 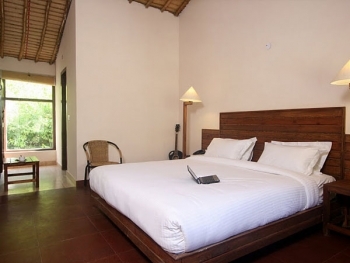 Guest rooms are spacious, appointed with wood floors, and rich furnishings which complements the jungle theme and respects the traditional skills of local craftsmen. Every room & cottage has a spacious marble bathroom with shower and deluxe toiletries. Luxury Riverview Rooms: The Luxury mountain and riverview rooms come with large bay windows offering a magnificent view of the surrounding mountains, valley and river. Rooms are spacious with wood flooring, with hard rock walls and spacious bathrooms equipped with shower and modern toiletries. Luxury river-view rooms are non air-conditioned. Riverview Cottages: The Luxury air-conditioned cottages comes with large bay windows offering a magnificient view of the surrounding mountains, valley and river. The raw feel of walls and the floor will give you a chance to be closure to nature blended with a comfortable luxury setting. Known for their rough look the walls are insulated is a way that keeps you warm in winters and makes it pleasant in summers. The big glass window offers a view of the glazing stars at night and breathtaking view of mountain, valley and river during day time. Note: Tree Tops Resort is situated on the banks of river ramganga and surrounded by mountains and valley, hence resort provides both non-air-conditioned rooms and air-conditioning cottages to cater to travelers individual preferences for accommodation. Tree Tops Revierview Corbett aims to provide a highly personalized service. The exquisitely decorated restaurant offers spectacular view of mountain ranges, panoramic view of valley and ramganga river. The Executive Chef provides an exquisite and versatile multi cuisine menu, offers Western and Indian cuisine. Much of the vegetables, salad and meat products comes straight fresh from the markets. - Ramnagar railway station pick up and drop on request and at an additional cost. Conference room besides offering latest technology and meeting facilities offers breathtaking view of mountain ranges and valley and can accommodate from 10 to 60 persons in a theatre style. Overall unmatched tranquil environment ensure that you have productive and successful meeting. - Accommodation for 2 nights and 3 days for two persons. - Early morning Tea/Coffee in the room. - Meals as specified in the plan. - Fruit Basket and cookies in the room on first day. - 15% discount on Ala carte Meals. - 15% discount on Jungle Safaris. - Tea/Coffe maker in the room. By Road from Delhi: Delhi - Hapur- Moradabad- Kashipur- Ramnagar, Mohaan, Marchula & then Tree Tops Corbett Resort, Jim Corbett National Park. The drive from Delhi to Tree Tops Corbett Resort, Jim Corbett National Park, takes approximately 5 and a half hours. By Train: By rail Nearest railway station is Ramnagar. Bus, taxi services are available from Ramnagar to Marchula.